While Keuka Studios specializes in cable railing, we also design and build custom glass railing systems. Just like cable infill, glass infill provides transparency. It also has a clean, minimalist aesthetic. If you want unobstructed views and a touch of modernist design, consider glass railing for your indoor or outdoor deck, balcony, or staircase. The owners of this Nantucket beach house wove a nautical theme throughout their entire home. For example, they chose white shiplap paneling for the interior walls. They also wanted a modern nautical railing for their staircase. To fit the motif, Keuka Studios designed a round stainless steel top rail and custom posts that accept glass infill panels. Our client in Rochester wanted the staircase and railing in their grand, open-concept entryway to make a statement. To give the space a contemporary look, our team crafted a floating staircase with glass railing. For the railing, we customized our Ithaca Style posts to accept the glass infill. The railing features a wood top rail and steel posts that are powder coated to look like copper. This modern home in Montauk features floor-to-ceiling windows and two decks enclosed by cable railing. Together, these features create transparency and bring the outdoors in. In order to complete this design, the homeowner requested a floating interior staircase with a glass railing. Paired with the stair’s open risers, the clear railing allows for natural light to pass through. Furthermore, our Ithaca Style railing posts give the railing a minimalist appearance that matches the rest of the home. 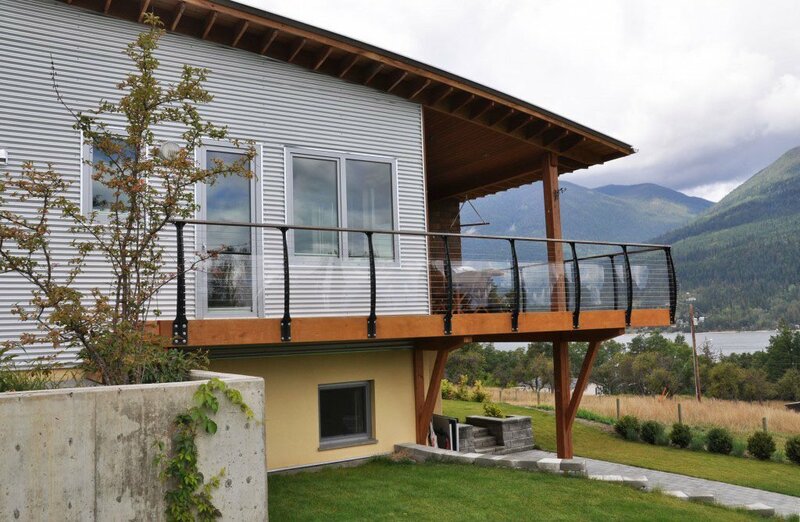 Keuka Studios designed a custom deck railing for this home in the Canadian province of British Columbia. To comply with the municipality’s building code, we built glass-like Lexan panels into a Keuka Style cable railing. We take pride in building craftsman quality and commercial grade railings and stairs for interior and exterior applications. Every Keuka Studios custom railing or staircase is built specifically for your space. As a result, our products fit perfectly with your home or business’ existing architecture both in terms of structure and style. To learn more about how each project moves from vision to reality, take a look at our custom railing design process.